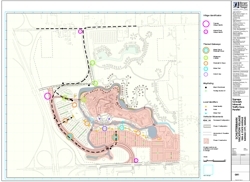 Circulation analysis, conceptual design of identity, wayfinding and thematic signage element for this 400 acre Water park, hospitality and retail venue. The project included preparation of preliminary design criteria for submittal and approval by the United Government of Wyandotte County, Kansas. Several sign types were developed to meet the needs of visitors and the themed environment to establish a unique experience that combined water park fun and adventure with a riverwalk retail environment and a variety of lodging venues, including treehouses, cabins, and a high-rise hotel. Many of the signage components were designed to include reclaimed oak trees salvaged by the owner, from hurricanes Katrina and Rita. LDG was a subcontractor to architects Berger Devine Yeager, Kansas City, MO and worked in collaboration with Turner Construction and landscape architects Land 3 Studio. Following concept design the owner decided to create design development and fabrication of the signage with their in-house staff.